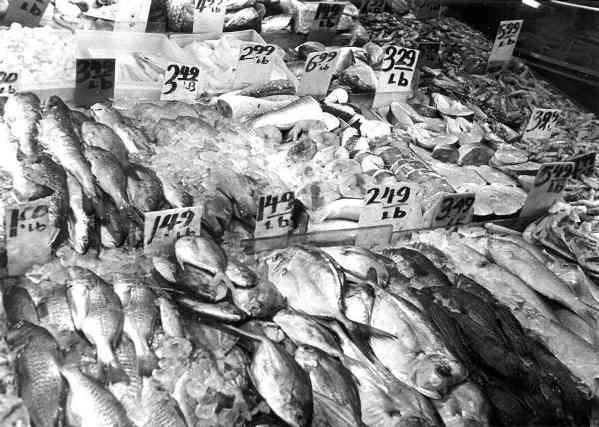 "Some of the finest selections of fresh fish in the city are available for way-below-uptown-prices in tiny storefronts that sprawl far out onto the crowded sidewalks of Chinatown. Even in black and white, you can practically feel the vibrant colors and smells... Once again, the Pen's 30-year-old mechanism came up with a perfect exposure: every kind of film I've used in this camera has come out beautifully, but good old Plus-X in it is pure magic." Circa 1968 Olympus Pen EES-2 with Plus-X film, exposure 1/200 with aperture automatically set by built-in meter. Developed in D-76 1:1 and printed at 5x7" on Luminos Flexicon VC RC with a #3-1/2 filter using a 1950s Omega D3 enlarger with a 50mm EL-Nikkor lens. Scanned to PCX file at 150dpi and converted to JPEG with minor contrast/brightness corrections.